Last Sunday, behind the heroic feet of newly crowned American hero, Carli Lloyd, the United States Women’s National Team won FIFA Soccer’s World Cup for the first time since 1999. It was the third World Cup in U.S. women’s history, and surely the most dominant, as they defeated Japan 5-2 after rushing to a 4-0 lead behind Lloyd’s hat trick. And while you have to be careful not to set a precedent that can lead to an overload of parades (or anger over those denied ones), you have to wonder if we have missed out on an American champion who has long deserved a similar honor. That champion is Serena Williams. It is an odd moment in American history that we overlook someone with the accomplishments of Williams. The circumstances around her help explain why. Tennis is rarely more than a solo sport. It is a yearly sport that really only garners major mainstream attention around its majors. It is not one of the Big-4 sports. And yes, she is a woman. But once you remember all that Serena has done, it’s hard to avoid. She has 6 Australian Open championships, most in the Open Era. 6 US Open titles, tied for the most with Chris Evert. After defeating Maria Sharapova, she will be going for her 6th Wimbledon title, third only to Steffi Graf and Martina Navratilova. 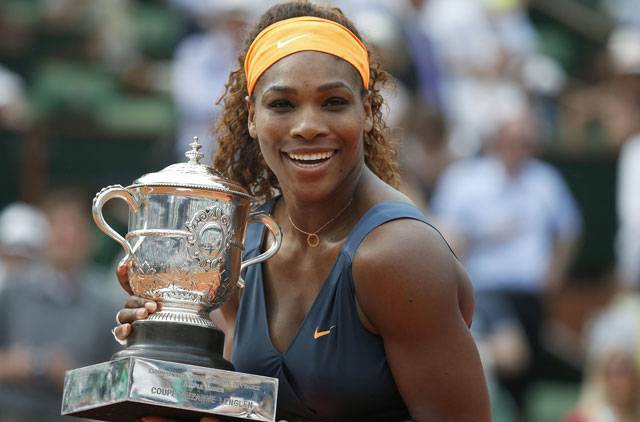 Since 2000, she has 19 Grand Slam titles. The next highest total is 7 [by both her sister Venus and Justine Henin. Serena already has the most women’s Grand Slam titles in *any* era for an American with 20 and if she can finish off take all 4 this year, she will finished tied with Graf for the most in Open Era play. Which is more impressive when you realize she is not even close to slowing down. Williams is on the verge of once again achieving the properly-named “Serena Slam”. If she can defeat Garbine Muguruza in the tournament Final, she will have won the last 4 slams dating back last year’s US Open, a feat she last accomplished in 2002-03. In an international sport where she has taken down the best from around the world, do we need more proof of her nationalistic accomplishments? Okay. Serena has also won a Singles Gold Medal at the 2012 London Games, along with the doubles medal, which is a total of 3 of those after her wins at Beijing in 2008 and Sydney in 2000. So yes, it is a lot to ask for an entire parade for one person, not even from New York, but step back and we realize this is one of the greatest American athletes we have ever seen, perhaps the greatest women’s sports star in history, and an African-American pioneer in a sport that lacked her background before she and her sister ran roughshod over the competition, and you can see how we have severely underwhelmed at celebrating her career thus far. In the coming months, she has a chance to do what no American has done before: win all four Grand Slams in one calendar year. This would complete a span of dominance we have never seen before. It might not lead to the same great moment our soccer heroes will get on Friday, but it’s time for people to at least realize that she is an American athlete who deserves the same level of recognition.